William Skelton built both the R32-powered Mk2s on this month’s cover, but while this more-door masterpiece is about as subtle as they come the same can’t be said for his lairy van featured later on in the issue. Words: Si McNally. Photos: Ade Brannen. It's safe to say William Skelton likes a Mk2 Golf. 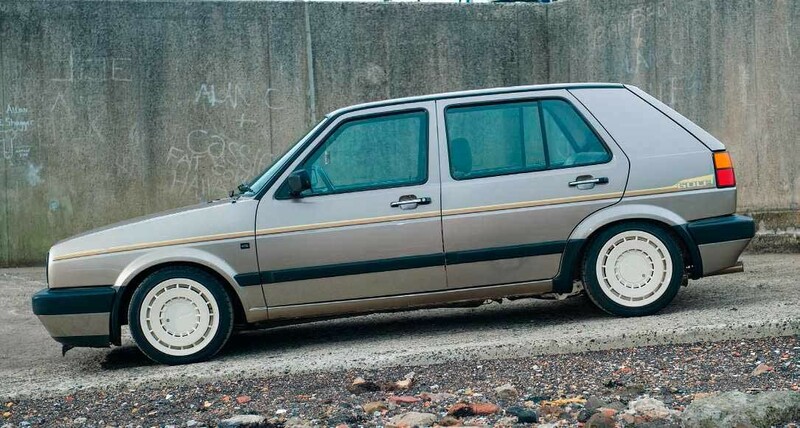 Here are his latest two creations… a pair of R32 Mk2s that couldn't be any more different! Our little Volkswagen shaped world is a funny one. In the Ford scene, you’ll find most people work either within the Ford modifying world itself, or in restoration, dealerships or body-shops. Obviously, there are a percentage in our scene that work in the industry, but it seems the vast majority don’t. It’s not a bad thing, just an interesting observation. One person that definitely can’t be accused of not working in the scene is William Skelton. 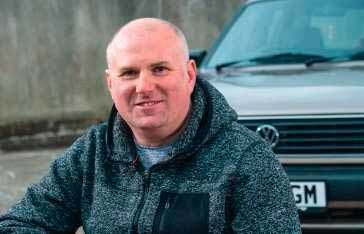 48-year-old William is the brains (and brawn) behind Dubnutz, one of Scotland’s foremost engine conversion specialists. 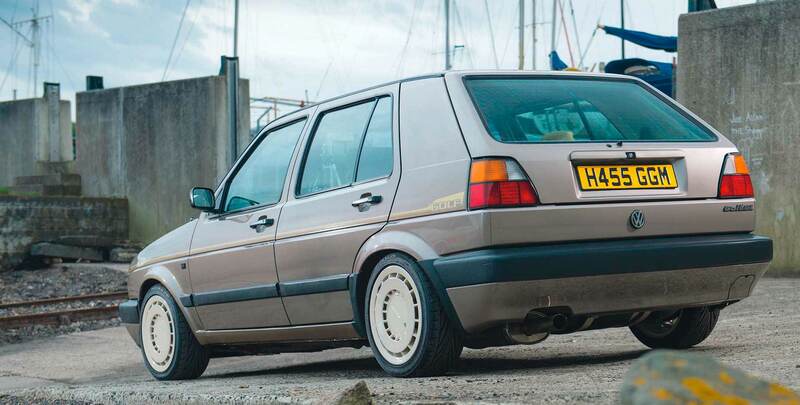 William has built himself a distinctly enviable reputation for providing some of the best conversion components going, with off-the-shelf looms and downpipes for the most popular of Wolfsburg’s offspring, alongside some of the tidiest and well thought out engine conversions we’ve come across, as you’ll see. But William wasn’t always making shiny bits to make elderly shopping cars go faster, although he’s always had something of a hand in making cars stop and go as they should. In fact, from the moment he left school, he was getting his hands dirty as a mechanic. Finding himself working at a few different garages, he eventually settled at a local Audi dealership, where he ended up working as a Master-Tech for 11 years! Impressive. But he was getting itchy feet at being “just another number”, and decided he needed to push himself to move forward. So, he made the decision to give up work in the motor trade and go back to uni, earning himself a bachelor’s degree in the process. Whilst doing this, he was supplementing income by modifying looms for people, and doing a damned-fi ne job of it, too! 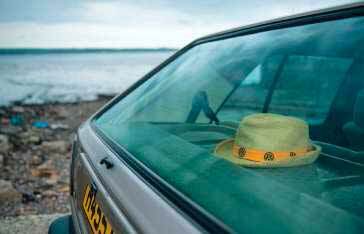 It didn’t take long after he’d finished his course for the light bulb moment to appear, and William realised he could make a rock-solid business out of doing what he loved, making Dubs go faster. Through all of this, William’s love for retro metal didn’t diminish. 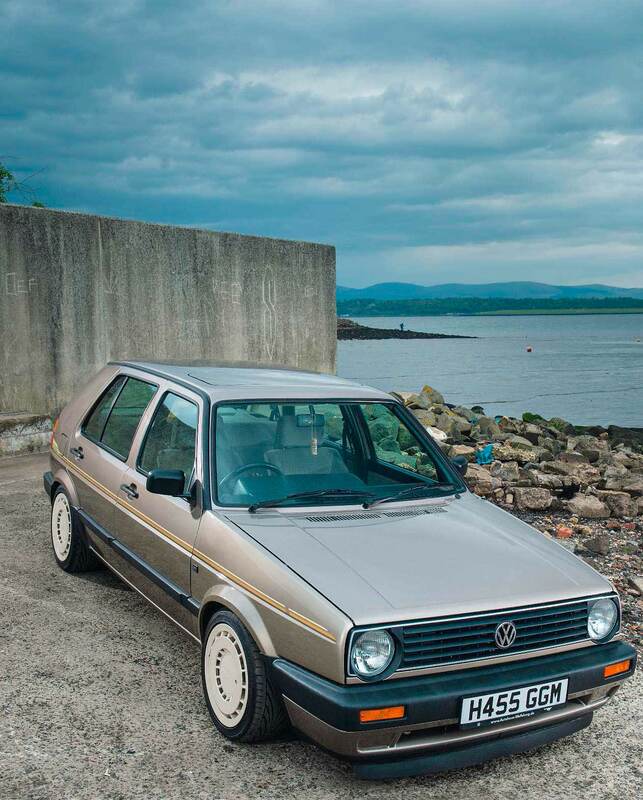 “I ran Club GTI up here in Fife for 11 years, and I’ve been involved with modifying and converting cars since the early 90s, I’ve had all sorts of cars from stock Golf GTIs, modified Mk2s, RS Turbos, Opel Mantas, Capris, Golf G60s and a Rallye.” The eagle eyed amongst you might have noticed something of a theme there; Mk2s. 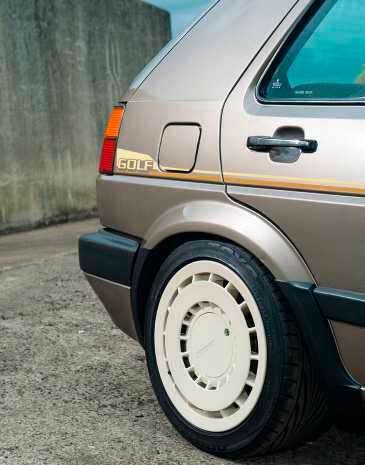 Which is how we ended up here, with this stunning, simple Sahara gold example. When William had decided he needed to build a demo vehicle for his new business venture, there was only really one option for him; another Mk2. With decent, unmolested examples becoming harder and harder to find nowadays, he put the feelers out far and wide. Knowing he couldn’t afford to be too fussy, he wasn’t overly bothered whether it was a three or five-door. After weeks of hunting for the perfect car, this little poppet appeared. Perfect! Except that it wasn’t, because William is in Fife, and the car was on the south coast of England. And didn’t drive. Oh, we didn’t mention that did we? It was being sold as a project, after the previous owner removed the engine and made some attempts to smooth the bay. It would’ve been a 16-hour round trip just to look at it, so after hours of conversations, reams of photos and taking the word of the seller, William decided to bite the bullet and get it collected. Luckily for him, it was just as good in the flesh as he’d expected, and would prove to be the perfect base for his project. In William’s words; “The car was purchased in the middle of February, without viewing it as it was at the other end of the country. A nervous week went past, wondering if I had bought a rusty Mk2 and not what I was told to be a mint, rust free car. When it arrived, it was just as the seller had described; rust free and very clean, apart from the engine bay, where someone had badly attempted to smooth it by tack welding in battleship steel plates. These were removed and to my surprise it had mint rust free chassis legs.” That’s what we would describe as a ‘result’. As you’d expect from a man who owns one of the best engine conversion specialists in the UK, this isn’t running its original 1.6, single cam wheeze-box. 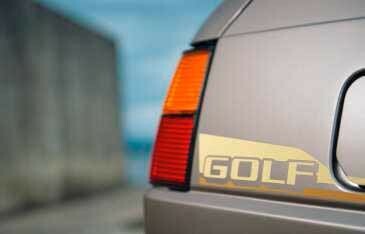 In fact, when William was looking for the ‘right’ car, he very deliberately set out not to buy a GTI. 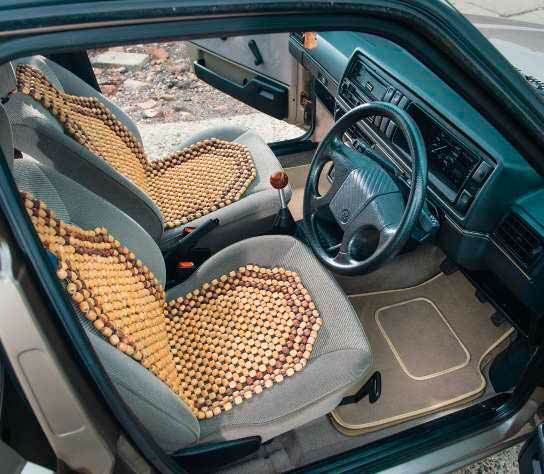 He wanted something unassuming, something that would surprise people when they popped the bonnet. And when they came across it in traffic. A real ‘wolf-in-sheep’s-clothing’. And that’s exactly what he’s achieved. When seeing it for the first time, you’d be forgiven for thinking it was running a standard engine and was just a very nice, clean Mk2. You might even think it had an ABF in it, or at the very most a K03 1.8T. But you’d be wrong. Very wrong, in fact. After spending weeks smoothing the bay (properly), getting everything routed and mounted exactly how it should be, and with every bracket, mount and piece of hardware cleaned and powdercoated, William was ready to slot the car’s new heart in place. 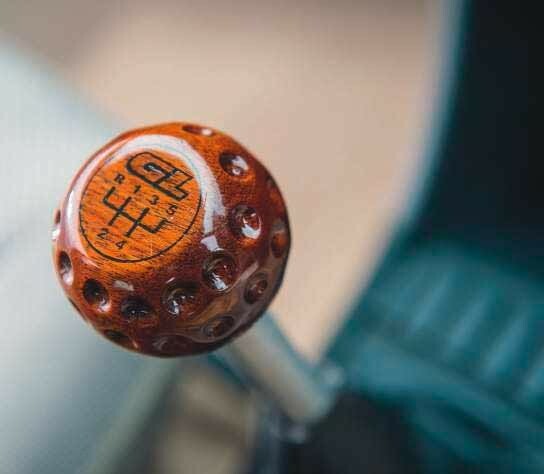 And rather than just slapping a turbo on, William went with the old ‘there’s no replacement for displacement’ adage, and decided nothing but doubling the car’s original displacement would do. 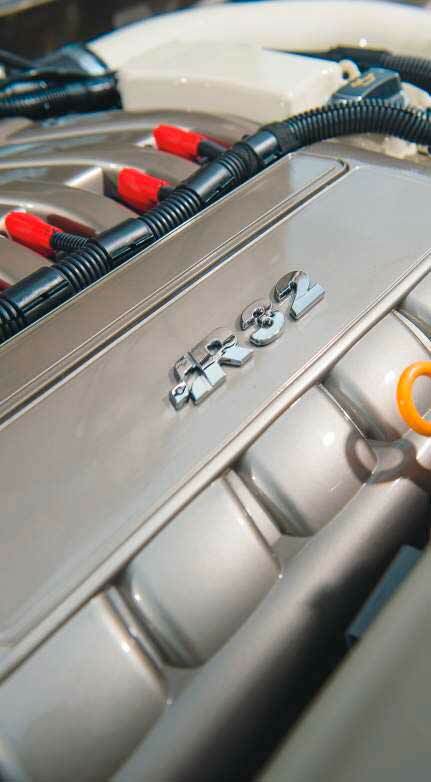 So a fettled 3.2 from a TT found it’s way into the Mk2’s unsuspecting and empty under-bonnet area. The stock BHE powerplant wasn’t quite enough for William though, and so a Ramair filter and 2.5” totally custom exhaust was thrown into the mix for good measure. 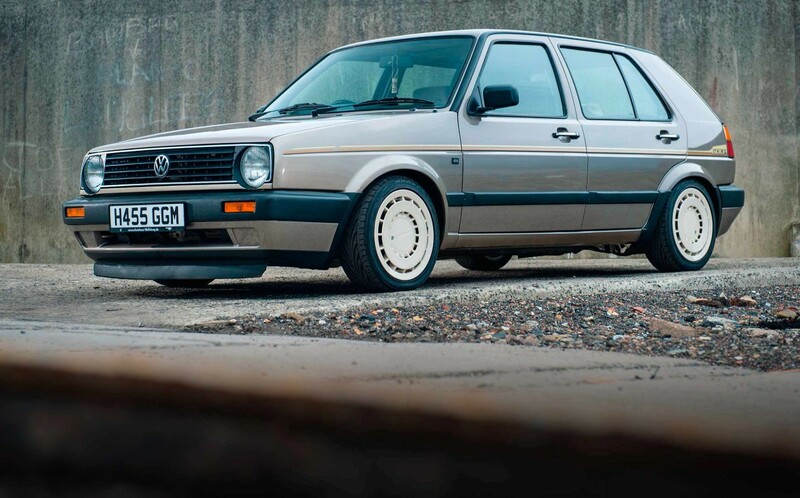 Top this off with one of his own custom 2.5” downpipes, and the Mk2 was almost ready to hit the road. And with 255bhp of normally aspirated power on tap, that was something William was looking forward to massively! The transmission was next, and to make sure all that power could be put down properly, this is something he didn’t want to scrimp on. 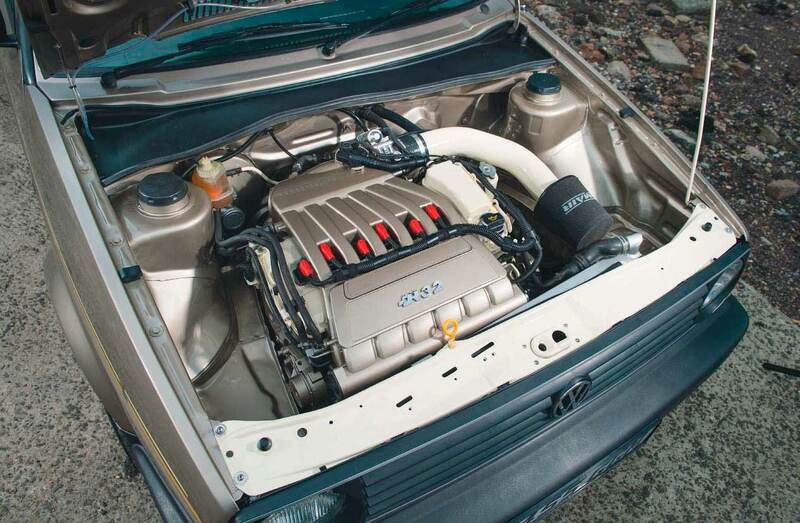 So a Corrado 2.9 6-speed box was sourced, and the car treated to a full hydraulic clutch conversion. 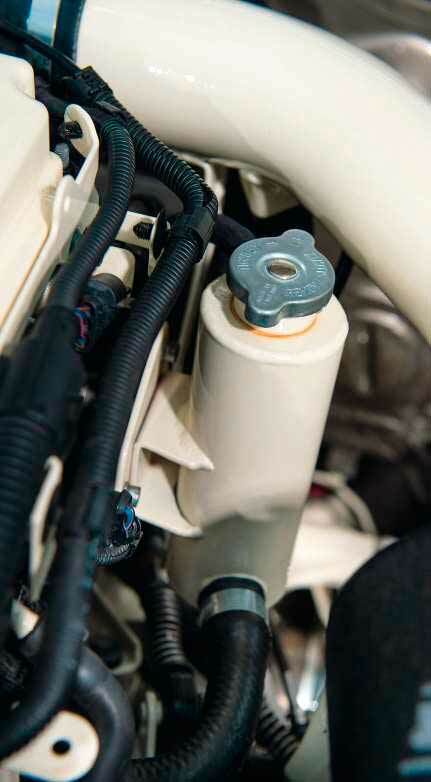 With a Sachs uprated clutch and custom pushfit hydraulic fittings, it’s safe to say the car can handle the card its been dealt. But, with this being a demo car, he wasn’t going to go out until it was perfect. Those beautiful and rare Phase 1 Zender Turbos were always destined to end up on the car, and stretched tyres weren't an option; William knew he would be driving this thing hard! So they found themselves wrapped in a set of 195 45R15 Toyo Proxes, meaning he could have totally confidence when pushing on through those mountain roads. With the wheels on, obviously the standard suspension just wasn’t going to cut it. So William got on to suspension maestros AP, letting them know exactly what he needed. With a set of custom sprung coilovers winging their way to him, he knew that the rest of the suspension needed to be up to scratch. First things first, he got the components straight to the powder coaters, where everything was lavishly coated in the finest cream hue. Once they’d been returned, and William had finished ogling and stroking them, they were treated to a complete SuperPro bush kit. Finishing touches were an Eibach front anti-roll-bar and GTI rear beam, giving some much needed extra braking on the back end. Believe us when we tell you this thing handles like a racecar, and completely belies its humble looks. With all that power, and ability to take corners at twice the speed the car was intended to (on a private road, officer), William knew he needed to uprate the brakes, too. 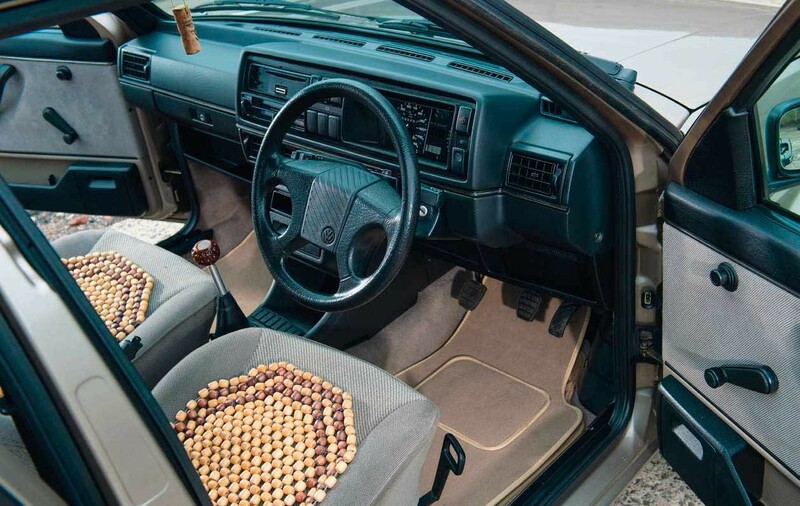 Rather than going the tried-and-tested G60 route, William took a belts-and- braces approach and went balls-to-the-wall. Up front there now sits an Ibiza Cupra 280mm setup with cross-drilled discs and EBC Red-Stuff pads, with the same Cupra setup with EBC pads at the back end. Should be more than enough to keep William’s pride and joy out of the heather. 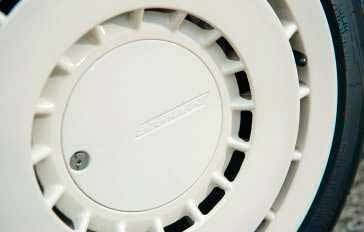 The interior and exterior have remained largely standard. The outside has seen the addition of a simple side stripe, just adding to that sleeper feel, and the inside has seen the addition of some snazzy beaded seat covers and a beautiful customised Mokawood gear knob. Simple. It’s at this point we normally ask what’s next; but not this time. 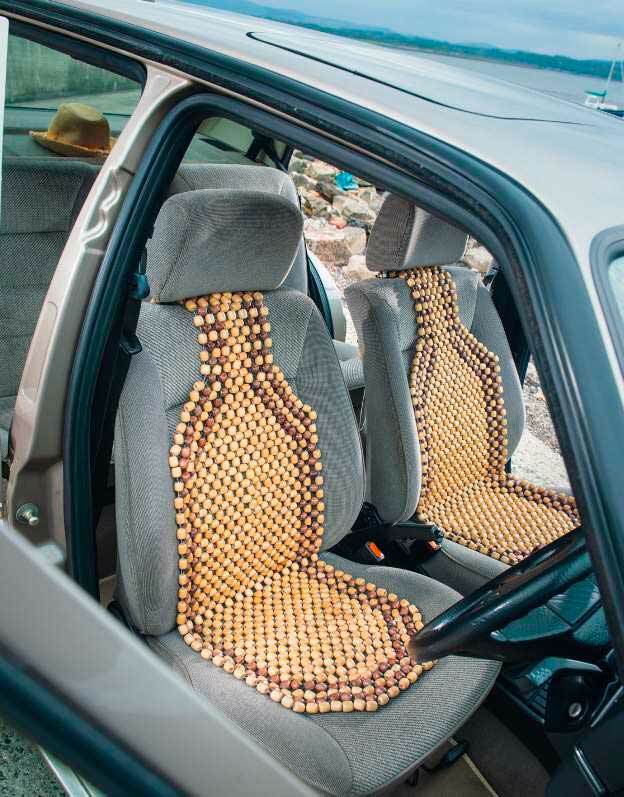 Plans were in place for a Harris Tweed retrim and some Recaros, but William decided he’d had his fun with the car and it was time to move on to projects new, and let someone else have their turn. This isn’t the only one of William’s builds in this issue though. The eagle eyes amongst you will have spotted the white Mk2 van he also built in these very pages. Flick to page 62 to see what happens when William lets his guard down and gets those creative juices really flowing!